A clear explanation of the issues will minimize confusion, misunderstanding, and error. A written warning is a good starting point for correcting that behaviour. Employees are some of the most valuable resources that an organisation has, and can contribute substantially to the success of a business. Conversely, poor employee performance or behaviour can lead to a decrease in product quality, customer satisfaction, and commercial success. If you are dealing with a poor-performing employee, a written warning is a good starting point for correcting that behavior. The letter informs your employee your organisation standards haven't been met, letting the employee know you're aware that they have conducted themselves in an inappropriate way. 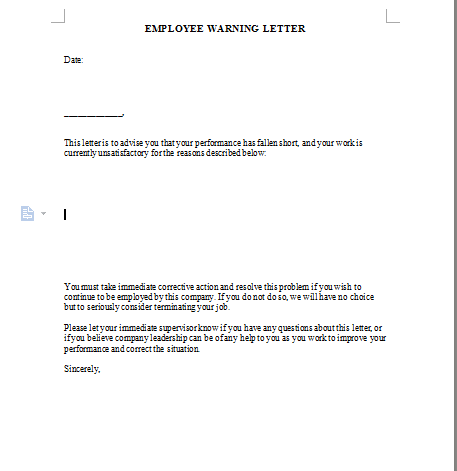 The letter includes steps the employee must take and a timeframe to correct the situation. If possible, an employee warning Letter needs to be backed up with other documentation: attendance records and performance reviews are common proof of an employee's poor performance. If you later terminate the employee, they'll have a difficult causing a labour dispute if you gave them ample, written warning.